Oil on canvas, 100 x 130 cm. It is the majestic trees and the misty sunlight in the horizon that create a sense of space in this overwhelming river landscape, which is broken up by temple ruins, castle towers and aqueducts. The Holy Family, Joseph and Maria, followed by the archangel Gabriel are on their way to Egypt to escape King Herod’s soldiers. The group is only a small detail in this magnificent landscape, inspired by the Campagna around Rome that Lorrain was so fond of. The shepherds with their musical instruments in the foreground recall memories of a distant Arcadia. Nevertheless, the dead tree in this otherwise paradisal landscape serves as a reminder of ultimate mortality. 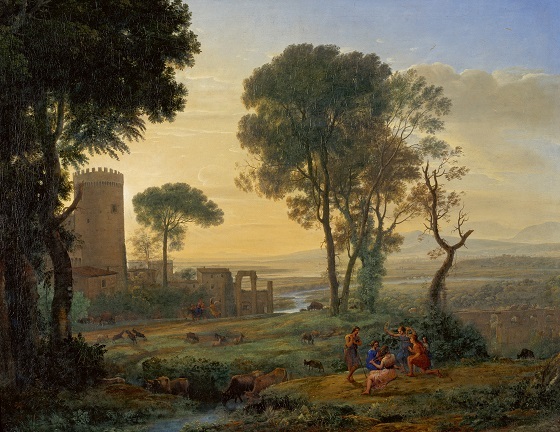 At a very young age, Claude Lorrain moved from France to Rome where he was apprenticed to the painter Agostino Tassi. His evocative paintings with a characteristically sensitive and poetic handling of light depict the Roman Campagna, harbours or coasts with biblical or mythological subject matter and miniscule figuration. Claude Lorrain gained fame throughout most of Europe already in his own lifetime and was greatly influential within the landscape genre for the Dutch painters who also travelled to Italy in the 17th century. His legacy is that of the most significant painter of Classical ideal landscapes.